Title [Athlete, William Kessler, I. A. C., standing with left shoulder toward image against dark backdrop] [graphic]. 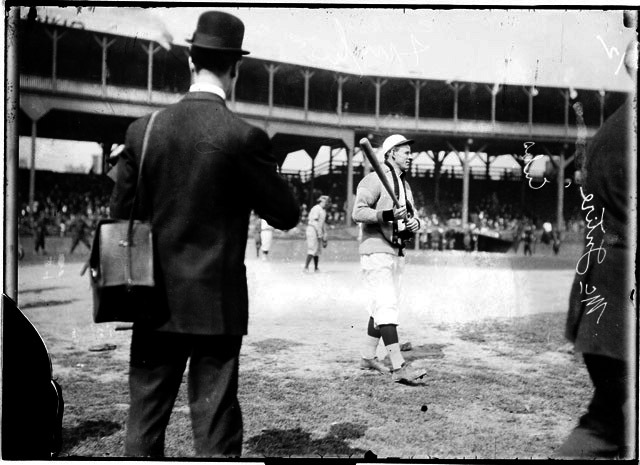 Collection summary Portrait of National League's Chicago Cubs baseball player Harry (John Reid) McIntire holding a bat and standing on the field at West Side Grounds, which was located between West Polk Street, South Wolcott Avenue (formerly Lincoln Street), West Taylor Street, and South Wood Street, in the Near West Side community area of Chicago, Illinois. Players on the field and spectators in the stands are visible in the background. Photographers standing on the field are visible in the foreground. Terms Governing Use and Reproduction The online images are supplied for reference purposes only. All other uses are restricted. To acquire copies, including improved copies, or permission for use, please contact Chicago History Museum, Rights and Reproductions Dept., 1601 N. Clark Street, Chicago, IL 60614. Near West Side (Chicago, Ill.) 1910-1919.